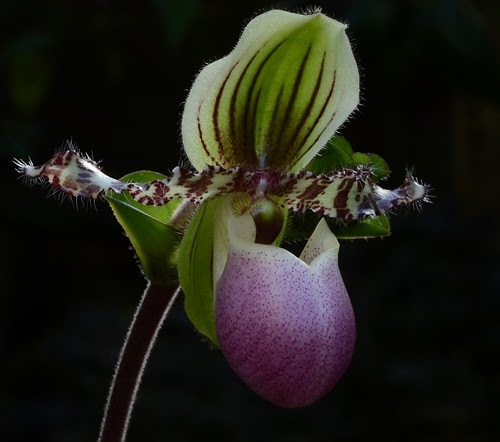 Paphiopedilum chamberlainianum is one of the prettiest slippers in our collection. And although our plant originated in a commercial laboratory, it is impossible for me to look at it without remembering that the history of this species in cultivation is bittersweet. P. chamberlainianum was part of the great wave of 19th century orchid introductions motivated by profit, not science. 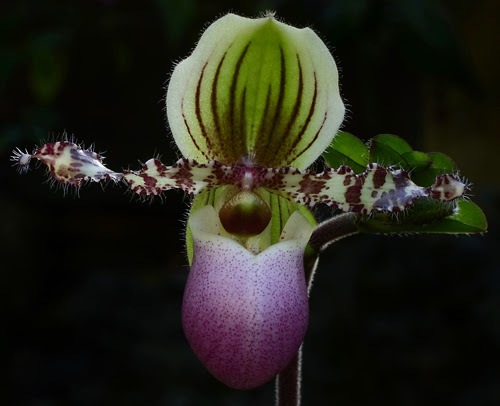 Paphiopedilum chamberlainianum is endemic to a fairly small area on the island of Sumatra. It was introduced into cultivation in Britain the late 1890's by the orchid nursery, F. Sander & Sons. The nursery, founded by Henry Frederick Conrad Sander in 1881, specialized in orchid species and was supplied by numerous collectors commissioned by Sander to collect plants in both New and Old World tropics. Sander & Sons was just one of several firms fueling the orchid craze with vast quantities of orchids. One of Sander's collectors, Wilhelm Micholitz, collected extensively on expeditions to the Philippines (Phalaenopsis micholitzii), Moluccas, New Guinea (Coelogyne micholitzii), Burma and South America. Micholitz shipped Paphiopedilum chamberlainianum (as P. victoria-regina) to Sander & Sons from Sumatra. Like many slippers, P. chamberlainianum has an extremely narrow distribution, making it vulnerable to over collection and habitat loss. Our Paphiopedilum chamberlainianum seems to always be in flower. Each inflorescence produces four to eight flowers, opening one at a time over a period of several months. 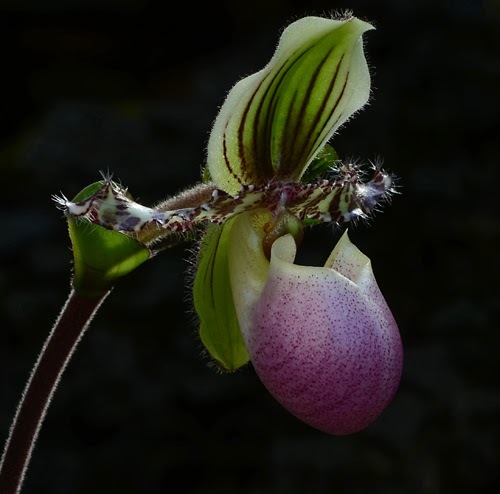 If you're having trouble distinguishing Paphiopedilum chamberlainianum from other closely related species, remember that P. chamberlainianum is characterized by stripes on the dorsal sepals, P. glaucophyllum by its glaucous (dusty blue-grey) leaves, and P. liemianum by leaves bearing hairs on the margins and purple spots on the undersides. Our Paphiopedilum chamberlainianum is happiest when we can keep the greenhouse temperature in the intermediate range (58º night minimum; 82º day maximum), a task grown more challenging in recent years as the outdoor temperatures trend upward.